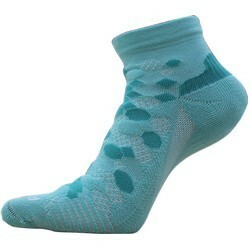 Manufacturer of functional socks & sports socks. Using high quality Lycra can intelligent adjustment of tightness, not easy to have loose situation and can wear longer. The air drainage design combine with honeycomb pattern has characteristics and funcational breathable. To strengthen the protection of Achilles tendon can help blood to quickly return and strengthen the cycle. Y-heel can give the heel enough coverage. Professional automatic suture technology to remove discomfort suture and prevent blisters.